Our favourite hike in the Canadian Rockies. The red dot is BANFF National Park. recommended route 6 days, 5 nights. Shorter is possible. Compare Matterhorn (Switzerland) and Mt. Assiniboine (Canada). Visit the prettiest peak in the Rockies, Canada’s Matterhorn 3618m (11,870ft). This is our favourite hike in the Canadian Rockies. Sunshine Meadows is home to hordes of Columbian and mantled ground squirrels. Assiniboine Lodge is a treat. The restaurant is open to all. Magog Lake is the most popular camping area for good reason. Even the overflow campsites (there’s no longer any overflow area) are fantastic. Mule deer sometimes wander between the tents. Mountaineers come to climb Assiniboine 3618m (11,871ft). the weather is highly variable. It can snow any day of the year. Or it can be 30°C (86°F). drinking water is provided at Lake Magog Campground and at Naiset Cabins. Treat everything else. Assiniboine Lodge, erected 1928, the first ski lodge in the Canadian Rockies, offers hotel services and a gourmet restaurant in one of the most gorgeous locations anywhere. The Lodge is expensive. We’ve only rarely stayed there. But right next door are the 5 inexpensive Naiset Huts built by Alpine Club of Canada founder A.O. Wheeler in 1925. Those can be reserved at (403) 678-2883 or fax (403) 678-4877, not online. A recommended heli-hike option shortens the trip. Helicopter one way Assiniboine Lodge to Mt Shark was CAD$175 per person + 5% tax (one way) = $183.75 in 2017. We’ve also shipped our backpacks / trash out by helicopter on the last day. $3 per pound per flight (includes tax) in 2017. That process was very disorganized. Bring your gear to the lodge early. Walking your gear out is free. We recommend this route as the best hike. … Mt. Assiniboine can … be reached from the Sunshine Village ski area via the rambling alpine meadows of Citadel Pass. Each has different sets of regulations. Most importantly, BC Provincial Park campgrounds are first-come, first-served. Banff National Park campgrounds must be reserved. In 2017, reservations could be made by phone, fax, or in person at Park Information Centres. Not online. If you are going to spend more than 7 nights camping in Canadian National Parks, the Annual Wilderness Pass is cheaper than paying night-by-night. It’s easy to get to our recommended start at Sunshine Meadows. You can hike up, ride a bus or take a gondola. The big problem on this adventure is how to get out. If transportation is a problem, backtrack to to Sunshine and ride the bus back to Banff. Otherwise you’ll need to arrange transport from Mt Shark … or fly to Canmore by helicopter. buy fuel & rent gear, if needed, at Mountain Equipment Co-op in Calgary. MEC is our favourite company in the world. you can hike in either direction. We’ve done both. It’s easy to get into and out of Sunshine Meadows. You’ll need to arrange a vehicle to Mt Shark. Or Helicopter to or from Canmore on the main highway. Our best source of information for decades has been Banff National Park rangers. There are many good hiking guidebooks. But we love Graeme Pole’s innovative binder editions where we can remove just the relevant pages for our hike, carrying them in a protective plastic slipcover. Brilliant! You can probably use any guidebook to travel the Canadian Rockies. The tourist infrastructure is excellent. Proof the Rockies were once under the sea. horn coral, easily found between the lodge and Wonder Pass. Gili – Life in Magic Land – Banff-Assiniboine: A Journey Into the Centre of the Rockies (2012) … Griz ! Click PLAY or Jeromet Ryan’s 2012 hike on YouTube. Click PLAY or watch our 2017 highlights on YouTube. Start with trying to get a booking on the West Coast Trail. IF that works, plan your trip around those dates. Next organize the Canadian Rockies, about 12 hour drive away by car. Best is Sunshine / Assiniboine, but there are many, many good alternatives close by. Next, look to add Waterton National Park in Alberta. The snow will be gone sooner there. It’s about 4 hours drive from Banff down to Waterton, Alberta. thanks so much for responding rick… we really appreciate it! we had actually narrowed it down to west coast trail and the sunshine walk… we were a little nervous because when you read about the west coast trail there are a lot of warnings and they make it sound quite dangerous and intrepid… what are your thoughts? how intrepid is it? we are reasonably fit and adventurous but we want to be sensible being 2 ladies in our 40s! I’d still try for the WCT first. If you don’t get the dates you want, go instead to Alberta. I like both directions equally right now. Logistics are slightly easier starting in Port Renfrew, however. Pingback: Pläne für die nächsten Wochen | Wo? Kanada! A friend and I are planning to spend a full 5days in/around the Banff area. I would love to do a trek from the Sunshine Trailhead to Nublet but I am having a difficult time gauging the difficulty of the trek and how long it would realistically take. We are both in our mid 20’s and quite fit…it will also be early October and I know that weather can be unpredictable and quite cold…any advice or feedback would be appreciated! Anybody Well prepare can do it, I had no experience in backcountry camping, did the right preparation and did it along with my wife and 6 years old daughter. (We fly some food in at Assiniboine to save on weight) the first 2 days were tough because of not beeing in shape, but got over it. Best trip in my life! October seem late in the season but probably doable. Great site thanks so much for all the infos! I’m planning it for next year and I’m wondering if people use a lot bear cannister in the rockies, I’m surpised that MEC in Calgary don’t rent them. Would you recommand to use them or all the camping sites are equiped with bear boxes or hangning rope? All the campsites are equipped with SOMETHING. Not many people use bear canisters in Canada though you can buy your own at MEC. Just wondering…if we park at sunshine lot, we can fly into the lodge nub peak? Then hike back to the car? Trying to figure this out. It appears to be a moderate hike? We have done that. You would need two vehicles however as the two trailheads are at least an hour drive apart. Is it at all possible to hike this area in the winter season? Do you know of any hikes that are good winter trails? Good question. I’m guessing that you could only hike the lower trails. In winter people helicopter up to Assiniboine Lodge and some backcountry ski. Great site and resource, thank you. Do you think it’s feasible doing the trail from Sunshine into Assiniboine in early/mid June? We are certainly hikers rather than mountaineers so is the snow level normally high enough by this time and/ or is avalanche risk too high at that time? Is there any lower elevation trails at that time you might recommend otherwise? Hi, I am contemplating between flying in, and then hiking out via Wonder pass. Or hiking in via Sunshine and the out via wonder pass. Is the Sunshine trail worth the hike? I cannot seem to find the highlights of that specific part of the trip. It’s all great. In either direction. Getting to the Shark trailhead is the major logistical problem if you don’t have your own transport. My name is Christina, we are looking for someone to swap cars with for our hike from Sunshine to Shark. We are starting on 7/16 and ending on 7/19/2019. If anyone is doing that hike in reverse or wants to talk about how we can make each other’s lives easier by swapping cars for the hike please shoot a reply! Thank you. You did a great job with this site. It is really coherent. 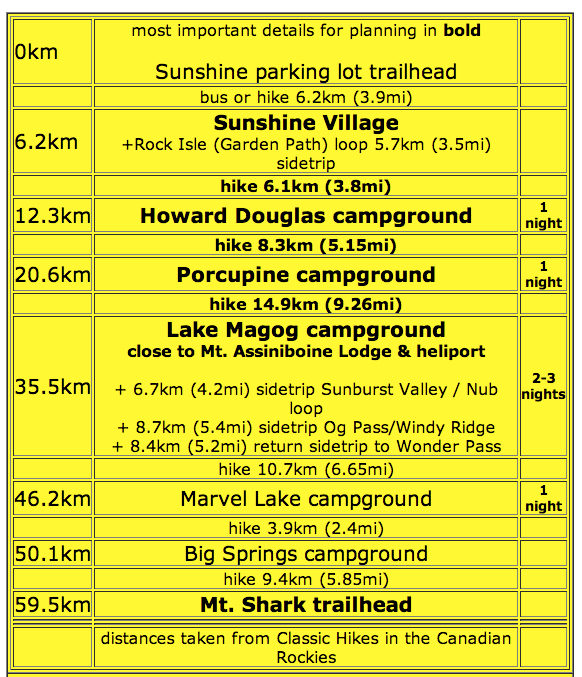 I’ve been researching this hike (from sunshine to Shark) for a while and it can be confusing to figure out details. I wasn’t able to get a spot to camp at Magog or Og the night we need (July 17th). So now I am trying to figure out where else to camp. I already booked Marvel Lake on the 18th so we have to keep to that I think. Do you have any suggestions for places to camp? We want to do this hike in 4 days and 3 nights. We planned to camp at porcupine the first night, but the only night that is set in stone is the 18th. In the past we simply stayed in the overflow camping. It was just as good as the booked campsites. … But I’ve just learned there is no longer an overflow area at the Magog or Og Lake Campgrounds! That makes it very tough. You may have to choose a different hike for this summer.